Welcome back to our leisure time series! Last week we found out how Canadian readers discover and acquire books, and the week before that, we looked at how Canadians spend their leisure time. This week, we're exploring the reading habits of Canadian readers (the 78% of the total survey respondents who had read or listened to at least one book in the previous 12 months) and their preferences when it comes to print, digital, or audio reading. Let's dig in! 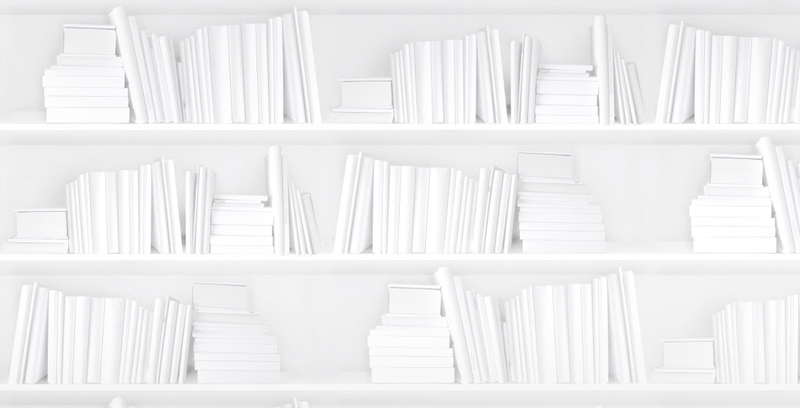 We asked readers why they read books. The most popular reason was to relax (65%). Other popular answers were: for enjoyment and to use their imagination (55%); to be entertained or for a good story (52%); to learn or improve skills (46%); to pass the time (44%); to discover interesting topics (36%); to become immersed in another world (36%); and to escape reality (36%). Next we asked about a selection of book-related activities, starting with where readers talk about books: 72% have discussed books they've read in person; 39% have discussed a book on an online social network; and 27% have participated in a book club or reading group. Of the readers who use social media, 46% said they have visited book-specific sites. We also wanted to know how frequently readers are reading: in the past year, 18% have read print books daily; 8% have read ebooks daily; and 4% have listened to audiobooks daily. Readers are listening to audiobooks more frequently than they are shopping, playing board games, or dining out. We asked print book readers, who make up 90% of all readers, about their reading frequency first; 67% said they read print books at least once a week and 20% said they read print books daily. Regardless of frequency, readers mostly read print books: 90% of readers had read at least one print book in the last year. This is down about 3% from the previous year. About half of all readers said they read an ebook last year, which is also down 3% from the previous year. Meanwhile, audiobook listening was up: 34% of readers had listened to an audiobook, up 6% from the year before. When we asked about any changes in their reading habits from the previous year, 27% of readers said that their amount of book reading/listening had increased. Most readers (58%) said they had maintained the same reading habits, while only 15% said that they read or listened to books less than the previous year. We asked ebook readers (49% of all readers) about the devices they own and which devices they primarily use to read ebooks. Almost all ebook readers (90%) own a smartphone, 70% own a tablet, and 42% own a dedicated e-reader. Most ebook readers prefer to read on a tablet (32%), though this is down 3% from the previous year, continuing a slight downward trend in recent years. Meanwhile, 29% of ebook readers primarily read ebooks on their e-reader, an increase of 4% from the previous year; 22% primarily read ebooks on their smartphone, a small increase of 1%; and 17% primarily read ebooks on a computer, an increase of 1% from the previous year. What devices do you use to read your ebooks? 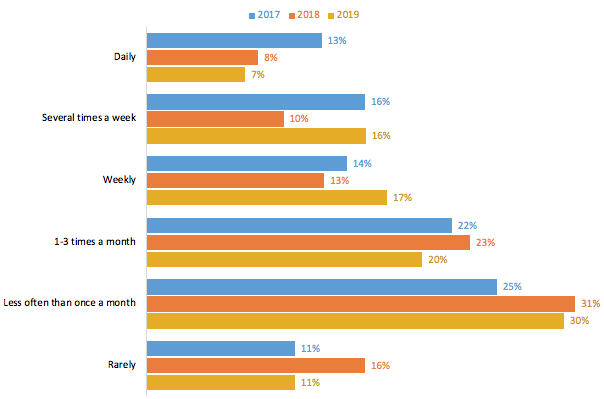 42% of Canadian ebook readers said they read books on their smartphone at least once a month, which is a significant increase from the 33% who said the same in last year's survey. We wanted to know more about smartphone reading, so we specifically asked about the frequency of reading ebooks on smartphones: 42% of ebook readers said they read books on their smartphone at least once a month, which is a significant increase from the 33% who said the same in last year's survey. When we asked what apps those readers used for ebook reading, six of the most popular choices were Amazon Kindle (39%), Kobo (23%), internet browsers (20%), Google Books (19%), Apple Books (15%), and OverDrive/Libby (14%). We asked audiobook readers (34% of all readers) how often they listened to audiobooks. We discovered that 40% of audiobook listeners did so at least weekly and 30% listened to an audiobook less often than once a month. Want to know more about audiobook usage in Canada? Check out our free in-depth study, Readers Are Listening: Audiobook Use in Canada 2018. Thanks for following our three-part blog series sharing the results of our annual leisure study!